Sattu is synonymous to Bihar. Though it is considered by many as a poor man’s diet but I really fail to understand the reason!! Sattu is basically roasted black grams powder although the process of making sattu is very different. Black gram is first boiled, then dried and finally roasted. They are then ground along with their skin and sieved before being packed. Don’t worry, this does not need to be done at home since packed sattu is available in most major cities of India. The sattu is a rich source of protein. 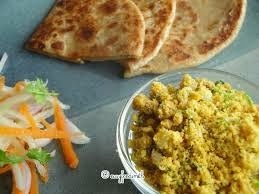 It can be enjoyed as breakfast with chutney/ pickle and a hot cup of tea. 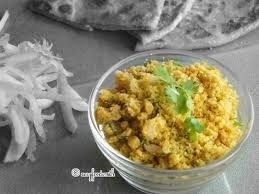 Or it can be consumed along with vegetable or even lentils. Lip smackingly good, I find these parathas as great saviours during long distance travels since they are filling and taste great even when eaten cold. I guess these are reasons enough for them to be packed for kid’s school lunch too! They are also used in a traditional dish called litti. Littis are small balls of whole wheat dough stuffed with sattu and baked in an open oven or over dry cow dung cakes. Once cooked, holes are poked in them using fingers and a generous amount of clarified butter is added to them. They are then consumed with a variety of chokhas. 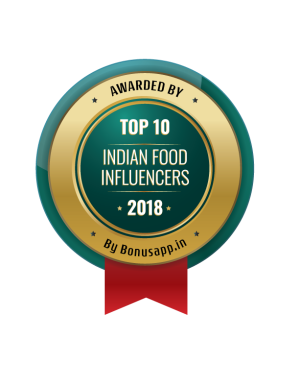 Chokha is made from an assortment of roasted and mashed vegetables such potato, aubergine, tomato, pointed gourd (parval) which are seasoned with salt and green chillies along with onion, ginger, garlic and fresh coriander. Since mustard oil is the soul of every dish cooked in Bihar, so a dash of mustard oil is a must in chokha. Take a mixing bowl and add sattu, carom seeds, nigella seeds and salt. Mix them well. Mix in the onion, garli, ginger, green chillies and coriander. 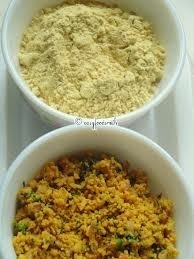 To this mixture gradually add the chilli masala, mustard oil and lemon juice. Using your hands keep mixing all the ingredients together. You will notice that the mixture will start gaining a grainy sort of texture. At this stage, I recommend that you taste the mixture so that you can adjust the flavours. Take a small amount (approx. the size of a ping pong ball) of dough and roll it using a rolling pin and some dry flour. 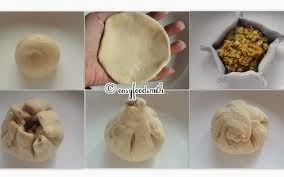 Transfer this rolled dough on to your palm and to the centre of the rolled dough, add a tsp and a half of the mixture. Bring the sides of the dough together like a cone and twist it slightly. Push this to the base to seal the top. Roll both sides in dry flour so that the dough does not stick to the rolling pin. Gently roll it into a parantha. Ensure that you do it gently otherwise the mixture may split the dough. Cook the parantha on a medium hot skillet. Turn it over and add a tsp of oil. Fry the parantha till it becomes brownish and crisp. Serve it with the Sarson Masala Bhindi or Tomato Chutney. Note: Please do NOT get intimidated by an ingredient and omit any of them. 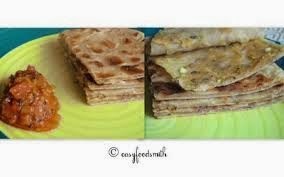 In the beginning I had reservations about using raw mustard oil for the stuffing but after having eaten this paratha, I would strongly recommend that you follow the recipe to the ‘T’. The mustard oil flavour will NOT be pronounced in the stuffed parantha. Note: Some people add some water to make the mixture come together. But somehow I do not like the texture of that mixture. But you can try that if it suits your taste. Note: You can adjust the amount of ingredients to suit your taste. Note: Try to ensure that you do not roll out very thick paratha since thin paratha is much more crisp and the filling is evenly spread. Thanks for visiting and stop by again!